Kelsang Dhondup (skal bzang don grub), known as K. Dhondup, was born in Rupin Gang (rus sbal sgang) in upper Dromo (gro mo), Tibet, in 1952. His father was Kelsang Dondrup (skal bzang don grub, d. 1972). His mother, Kelsang Dolma (skal bzang sgrol ma, b.1919/1920) was born in the kingdom of Sikkim, in Gangtok, to Tibetan parents. Following the Chinese takeover of Tibet, K. Dhondup’s family came to India through Bhutan and settled in Darjeeling. K. Dhondup attended the Central School for Tibetans, Darjeeling, which was set up in 1961 by the Indian government to educate the children of the Tibetan refugees. Dhondup then attended the prestigious St. Joseph’s College, also in Darjeeling, and received his Bachelor of Arts degree in 1972. Known also as North Point, St. Joseph’s College was a Christian school started by the Jesuits. Alma mater of the Nepali kings, the Tibetan aristocracy also sent their children here to be educated. K. Dhondup came to Dharamsala in the winter of 1975 to join the workforce of the Central Tibetan Administration as a temporary staff in the Council for Tibetan Education. Early the following year in 1976, he began his permanent posting at the Library of Tibetan Works and Archives (LTWA; bod kyi dpe mdzod khang) based in Gangchen Kyishong (gangs can skyid gshongs). Founded in 1972 as an Institute of Buddhist and Tibetan Studies, LTWA’s mission was to act as a comprehensive reference center for Tibetan Studies and to preserve Tibetan books and manuscripts. Its founding director was Taktser Rinpoche, Thubten Jigme Norbu (thub bstan ‘jigs med nor bu, 1922-2008). The founding Deputy Director was Gyatsho Tshering (rgya mtsho tshe ring, 1936-2009), a Sikkimese who joined the Central Tibetan Administration in 1963 and built the institution into a comprehensive resource center for Tibetan studies. In 1979, K. Dhondup founded the Tibetan Communist Party-in-Exile with Namgyel (rnam rgyal), with the blessing of the Fourteenth Dalai Lama Tenzin Gyatso (tA la’i bla ma 14 bstan ‘dzin rgya mtsho, b.1935). It was a controversial organization and in later years, K. Dhondup told the writer Jamyang Norbu (‘jam dbyangs nor bu) that his advocacy of Communism was a youthful mistake. 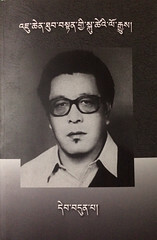 Working under Gyatsho Tshering, who retired in the 1990s, K. Dhondup stayed at LTWA for the remainder of his fruitful career, eventually becoming Publication Head of the English Publication Department in 1980 and Managing Editor of the Tibet Journal, the Library’s scholarly quarterly publication, the following year. He was Managing Editor of the Tibet Journal from the years 1981-1987. K. Dhondup’s years in Dharamsala were extremely productive and he became a prominent literary and cultural figure of the Tibetan exile world. From 1992-1995, along with Tashi Tsering (bkra shis tshe ring), Pema Bhum (pad+ma ‘bum) and Jamyang Norbu, K. Dhondup was a governing body member of Amnye Machen Institute, the respected center for Tibetan studies and publisher of Tibetan language works. He was also on the editorial board of one of the first Tibetan literary journals in English titled Pema Thang (pad+ma thang), a literary magazine that enjoyed a brief and fruitful run before folding, as well as the editorial board of a new Tibetan language monthly newspaper The Unwavering Truth (ma khyog drang thig). From 1977-1982, he was the Dharamsala correspondent for Tibetan Review magazine, which under the stewardship of editor Tsering Wangyal (tshe ring dbang rgyal), known simply as “Editor,” grew into the premier English language periodical of the times. Following the conflict around the publication of his second book K. Dhondup left government service and moved from Dharamsala to Delhi with his wife. His wife Tsewang Dolkar Khangkar (tshe dbang sgrol dkar khang dkar, b.1959), a doctor of traditional Tibetan medicine whom he married in 1977, ran her clinic in Delhi. Her mother was the well known doctor Khangkar Lobzang Dolma (khang dkar blo bzang sgrol ma, 1934-1989) from Kyirong (skyid rong). K. Dhondup and Tsewang Dolkar had three daughters, two of whom are still living. K. Dhondup died at his home in Delhi on May 7, 1995. By Tenzin Dickyi is an Editor at the Treasury of Lives. She is also English Editor of Tibet Web Digest, a project of Columbia University’s Modern Tibetan Studies program.